The 1990DN Series Resolver Interface Module plugs in as a node on any control system or a DeviceNet Scanner Card. Continuous rotary position data is provided with 23-bit resolution. In addition, eight built-in user programmable set-points allow direct control of critical functions. All programming is done over the DeviceNet network. This product can be used with the 1986 Series Resolver. • Conformance- This product has been tested by ODVA’s authorized Independent Test Lab and found to comply with ODVA Conformance Test Software Version A-12. 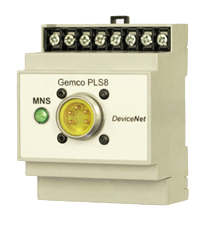 The EDS (Electronic Data Sheet) file is a simple text file used by network configuration tools to help identify the AMETEK Gemco LDT and easily commission it on your network.